Welcome to the St. Stephen’s website. We are glad to have you here! The season of Lent is upon us, which is a time for reflection and preparation for Easter. 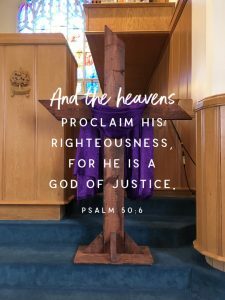 The focus during Lent tends to be on our sinfulness and God’s goodness, as we approach the most important event in history: the resurrection of Jesus. We are starting the Lenten season this year with a service of ashes. All are welcome at 6:30 pm, Wednesday, March 6. At St. Stephen’s, we are reading books of the Bible related to Repentance and Justice over the Lenten season. Follow along at home by reading Ezra, Nehemiah, Amos, Luke, and Ephesians. You can also join us on Sunday to hear messages from each of these books, or listen online here. We hope you can join us! We have many opportunities to worship together during Holy Week. Come walk with us as we travel with Jesus the road to the cross and then experience the joy of his resurrection! Sunday, Apr. 14, 10 a.m.
Thursday, Apr. 18, 6:30 p.m.
Friday, Apr. 19, 10:30 a.m.
Sunday, Apr. 21, 10 a.m.
JOIN US FOR BREAKFAST BEFORE SERVICE!